This week everybody has been talking about Fashion Week, either flaunting the fact they are there or explain why they are just soo over it. One of the (many) gripes bloggers everywhere have noted is the street style on display. To be honest, all the moaners do have a point. Most of the people who have their photos taken for street style features probably never wear anything nearly as out-there normally. They probably are putting it on for the cameras, but hey… if that makes them happy. All this talk inspired me a bit though. 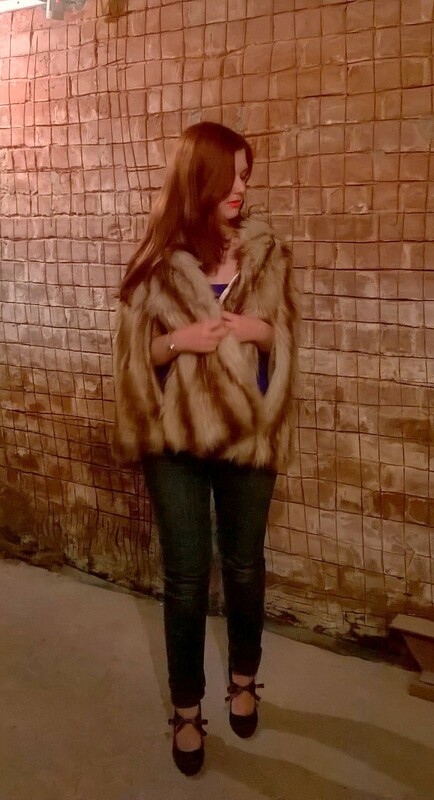 Then Cosmopolitan tweeted a link about how faux fur was a bit of a street style trend. And voilá! The outfit of the week was decided upon; and incorporates two key factors. I would never normally wear this. My boyfriend bought me this cape last year-ish. We picked it off the rail in Dorothy Perkins thinking it was a jacket, but discovered it was a cape. I’d quite like a cape, just not a fur one. He on the other hand insisted I should get it, and well, basically he was paying so I thought why not. I feel like this should work. If it sat a bit differently, or even if the arm holes were set back a bit it might have made a huge difference. As it is though, it makes me feel like a 50’s film star when I put it on, then when I look in the mirror I feel (and look) a bit daft. The photo at the top of this page was actually an out-take, I was caught off guard, the cape had slipped; but it’s probably the best it’ll ever look. As you can see here, it just makes me look a bit sheepish, self-conscious and as if I’m channelling cave-man chic. Which weirdly, just isn’t my go to look. Sorry. The shoes on the other hand I adore. 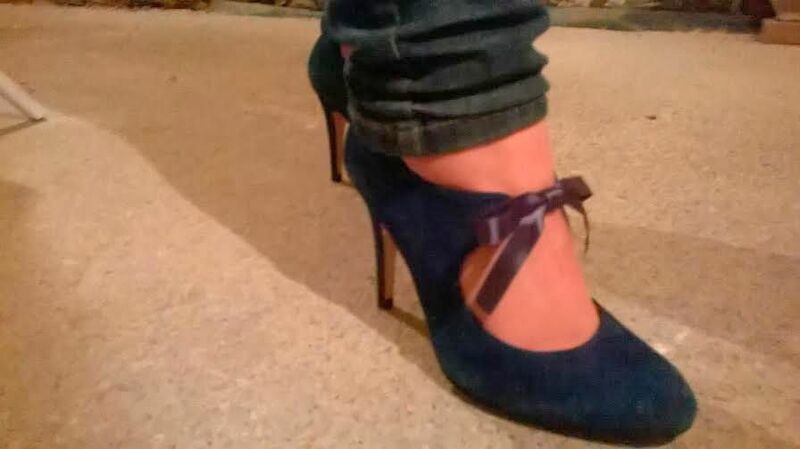 Dark teal suede, 1940’s style and a bow… a dream come true in shoe form. I got them from LK Bennet, though I don’t think I’ve ever properly worn them. Turns out LK Bennet are really generous with their sizing. I feel like I should apologise for the quality of the photos on this post, especially the shoe photo. I can explain; things didn’t go quite to plan over the weekend so my gorgeous (and helpful) boyfriend offered to take some photos one evening during the week. What with work and other commitments, Tuesday was the only day we could do. So Tuesday evening I rang him up to ask what time he’d arrive to find out he had totally forgotten. Which meant he basically left work an hour early (after asking for overtime) to come take photos of my clothes. When someone does that, you can’t really complain about the quality and ask them to start over can you? He also did a Vine for me. So if you’re on Vine let me know and I’ll follow you because I have NO IDEA what I’m doing on there and it would be nice to see what you guys are doing. Cape: No longer for sale. Don’t worry, you’re not missing much though. Shoes: Out of stock (I really need to go shopping just so all these clothes aren’t mega old) but these are pretty similar. Previous Post Healthkick: Getting a Head-Start on Summer. Next Post Networking: Friendly or Fake?